I am a master instructor with >1,200 dives, and was diving with a master diver trainee and newly qualified instructor (<120 dives). The deck hand asked if my tank had been changed. Previously, the crew had swapped my tank for a full one as soon as I came on board. I told them I'd checked my air and the tank pressure was 234 bar. Off I went and, shortly after, the other two followed. Down at 16 m (~50 ft) and still descending, I felt my tank going dry (increasingly harder to draw air) checked my gauge and yep, I was out of air! I looked up then looked at my buddies, both about 4-5m away (12-15 ft). I started tapping my tank, the instructor ignored me but the trainee looked up, so I gave the out of air signal, we swam toward each other and I took her primary regulator as she grabbed her octopus. We surfaced, the instructor (who was my dive guide) came up with us. The surface crew swapped my tank and off we went to finish our dive. So what happened? Well, I am in my early fifties and recently started wearing plus 1 reading glasses. I don't need them underwater due to magnification when the mask is underwater, however as I was gearing up I did not have my glasses on, and when I checked my dive computer and read 234 bar, in fact it was 23.4 bar. The decimal point on the display is minute, and I couldn't see it. Tank pressures will vary with temperature and will change slightly when a tank is left in the sun, or when a diver enters the water, due to temperature change. 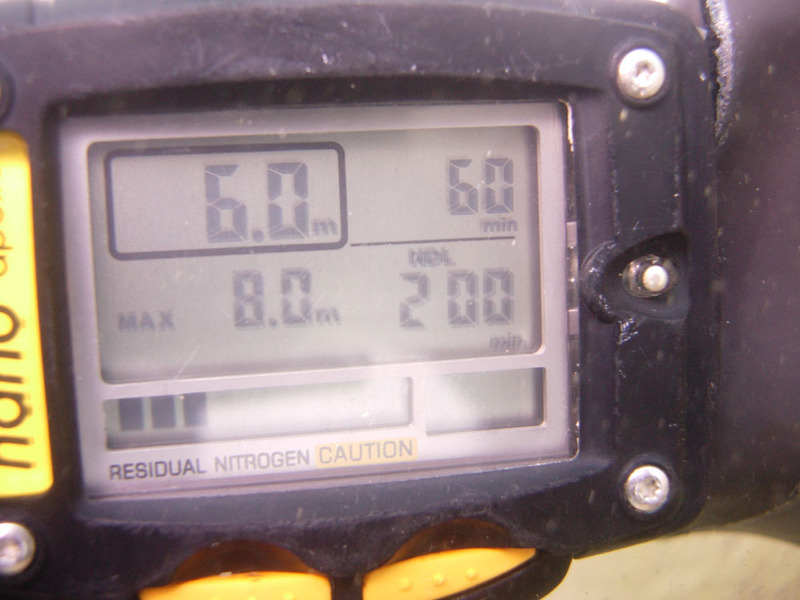 Therefore, this level of detail when displaying tank pressure is unnecessary in a personal dive computer and may lead to confusion in any diver, but especially if a diver's eyesight is less than 20/20. Aside from that, it is also a good idea to return to the boat with 50 bar remaining in the tank. Returning with just 23 bar does not leave much room for dealing with the unexpected. If you would like to report a diving incident or injury, click here.